"Ian McKellen: Acting Shakespeare" is more than just about, well, acting Shakespeare. It's a most unique one-man show: part lecture, part performance, part anecdotes, with McKellen playing the life of the party, if I can use such a term without making the actor sound like a boor. He's anything but. Lively, funny, excited to be sharing his love for the Bard and for the stage. 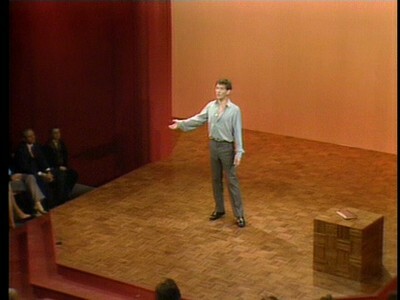 Originally conceived in 1977 as an expansion of a previous solo performance, "Acting Shakespeare" is built around a series of stage-themed monologues: the "All the world's a stage" speech from "As You Like It," Macbeth's woes of the tale told by an idiot, Hamlet's instructions for his "Mousetrap," etc. He performed this show intermittently for the next five years in both theaters and lecture halls, finally taking it on tour in 1982, and reviving it every now and then through 1990. You can tell where McKellen planned to deviate and where he planned on sticking squarely to the text. His lectures on Shakespearean history - which detail the stories behind the plays, the world in which they were first performed, the specific reasoning behind the choice of a single word or phrase, and so on - are more or less locked down as the educational side of the evening, while his looser anecdotes and jokes are allowed to flow. And flow they do. Watching McKellen here is like hanging out with him at the world's best get-together, listening closely as he punctuates grand tales from his own misspent youth with corny jokes and amused quotations. He's having a ball here, holding court at a cocktail party of his own design. Of course, the reason we're watching is to see the actor dig deep into the world of the Bard. On a bare stage, with no costume changes or props (just a solitary chair and a box, theater at its purest), McKellen is in his element - and his performances are superb. The camera gets in close, revealing minor details that would go overlooked on stage, little touches that shows the actor so fully engaged as the character. Watching him switch so easily between multiple characters and himself is quite amusing; there's little preparation needed for him to become the roles he's known so well for so long. Notable selections include pretty much everything he does, really, although as highlights, I'd pick his brutally emotional take on Macbeth and, for novelty value alone, his interpretation of Juliet as (but of course!) a hormones-and-attitude teenager. McKellen is mesmerizing here, educational but never stuffy, talkative but never long-winded, entertaining but never pretentious. 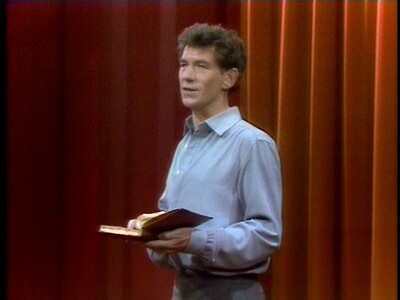 C'mon: it's Ian McKellan performing Shakespeare for an hour and a half. How could it not be great? Curiously, E1 Entertainment has divided the 85-minute program into only four chapter stops: two per "act," and two for the intro and closing credits. You're prevented to jumping to your favorite monologue, forcing you to experience each act as one long piece, just as you would on stage. The video is soft, colors are muted, and grain is everywhere, revealing the shot-on-video nature of the project; it's an aging no-budget early-80s PBS project, and it shows. Problematic on the transfer end is some heavy edge enhancement, which remains noticeable throughout. Presented in its original 1.33:1 broadcast format. On the other hand, McKellen's glorious voice sounds superb via the mono soundtrack. The track is simple stuff: just the actor and the occasional audience reaction. As such, it's just fine all around. Optional English SDH subtitles are provided. Not counting the promo for "Twelfth Night" that plays as the disc loads, there are no extras on the disc itself. Packaged within the keepcase, however, is an eight-page "reference guide" that's more like a theatrical program. The booklet breaks down the show's two acts, reveals show facts, and a quick note from McKellen himself (written in 2009). "Ian McKellen: Acting Shakespeare" is a rousing showcase for McKellen's talents as actor, teacher, and storyteller, and a wondrous introduction (or re-introduction) to the world of the Bard. Ignore the transfer problems and tune in to a fantastic show. Recommended.